Invisalign vs Braces: Which Orthodontic Treatment is Right for You? If you're considering orthodontic treatment for yourself or your teen, you've got a decision to make. Do you opt for traditional treatment using metal braces? Or do you go with Invisalign, which uses a series of clear plastic trays to straighten your teeth? At OrthoCare Orthodontics, we get asked the "Invisalign vs braces" question quite a bit. While the decision is ultimately yours to make, we'll lay out the pros and cons of each treatment option. With Invisalign treatment, a series of 3D printed trays are used to move your upper and lower teeth to more aesthetically pleasing positions. You'll change the trays periodically, typically every week. Each new tray slowly brings your teeth into a better position. There's no need to come to the office every month for adjustments like you would with metal braces. You can manage your own treatment as long as you replace the trays on the schedule directed by your orthodontist. Invisalign trays are taken out when you're eating or cleaning your teeth. That means you won't have to change what you eat or avoid the foods you enjoy in order to accommodate your orthodontic treatment. You also won't have to purchase specialty equipment just to keep your teeth clean while they're being straightened. The only thing you'll have to remember is to brush your teeth before you put the Invisalign tray back over your teeth after eating. There are other benefits to Invisalign as well. Invisalign doesn't come with the discomfort and problems often associated with metal braces. Invisalign trays are comfortable and don't leave your gums and cheeks sore. Plus, the trays are completely clear. No one will ever know you're having orthodontic treatment unless you choose to tell them! 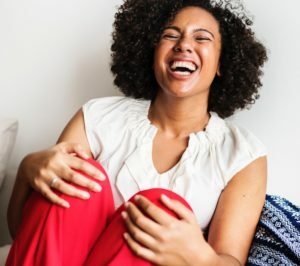 While they have many benefits, Invisalign may not be right for people with significant spacing issues or over/under bites. The system is good for people with relatively straightforward straightening requirements. Used for decades to straighten teeth, traditional braces are usually best for more complicated cases that require bites to be corrected or the palate expanded along with straightening the teeth. Braces consist of metal bands and brackets with wires threaded through that connect your teeth. These elements work together to slowly move your teeth into the correct position. Metal braces are glued to your teeth, so you can't remove them. That means they can be a challenge to keep clean. Food particles get stuck in the brackets and under the wires. You may need to purchase a water pik or other equipment so you can adequately clean food from your braces. You'll also need to avoid some foods completely. Sticky, crunchy and hard foods are not permitted during orthodontic treatment with metal braces. If you play contact sports, you'll also need to wear a mouth guard to protect your braces during the game. Metal braces also must be adjusted regularly. So, you'll need to return to the orthodontist's office at least once a month for adjustments to be made. Your specific treatment plan will dictate exactly how often you must return. And the adjustments can cause discomfort to your mouth. The metal brackets rub raw areas on your mouth which makes it difficult to chew or talk. 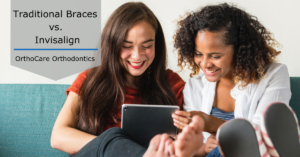 Even with these drawbacks, metal braces are the best choice for many adults and teens who need a good deal of correction. If you have additional questions about treatment with Invisalign vs braces, please contact our office. We're happy to help you decide which option is right for you. Plus, new patients can receive $500 off orthodontic treatment at any of our locations! The biggest, and perhaps most difficult change to make when you get braces is learning a whole new oral care routine. No longer will your routine involve just running into the bathroom, quickly brush and floss, and go on with your day. Instead, your new oral care routine will be a bit more complex and time-consuming. That’s why we’ve put together these braces hacks to learn how to keep them clean. It’s extremely important to make sure you’re brushing with the right type of toothbrush. Using the wrong type when you have braces can cause a number of problems. Doing so can damage the enamel on your teeth, scratch your gums, bend the wires of your braces, and damage the brackets that are bonded to your teeth. Note: You may need to replace your toothbrush more than every three months when you have braces as the bristles on your brush will fray faster due to the wires and brackets. Brushing your teeth with braces isn’t all that different from brushing without braces. The only real difference is that you’ll want to brush gently to avoid damaging the wires and brackets. It’ll also be a bit more time consuming since you’ll be working the toothbrush around all the brackets and wires. Step 4: Brush all of the surfaces of your teeth, including chewing surfaces and inner and outer surfaces. Note: To keep your teeth and braces really clean, you’ll want to brush after every meal and right before bed. Another important part of your new oral care routine with braces involves flossing. You can’t just run the floss between your teeth anymore. Instead, you’ll have to work it around the wires, brackets, and in between your teeth. Luckily, there is a small dental tool that helps a lot known as a floss threader. A floss threader helps you get the floss in those hard-to-reach areas. Once the floss has been threaded into those hard-to-reach areas, you can effectively remove any plaque or food particles that have gotten stuck between your teeth. Interdental toothbrushes are a new dental tool that should become part of your new oral care routine. These tiny little bristled brushes are used to clean around the wires and brackets of your braces. This tiny toothbrush reaches those areas which your regular toothbrush may miss. Watching what you eat throughout the day can really help to make your oral care routine a little easier to do. Avoiding foods that are known to increase your risk of tooth decay or damage your braces or the protective enamel on your teeth can help keep your mouth healthy and clean. Have additional questions about how your oral care routine will change once you have braces? Feel free to ask any questions you may have during your orthodontic consultation with the orthodontists at OrthoCare Orthodontics. During the orthodontic consultation, our orthodontists will explore treatment options with you, discuss what types of results you can expect to see, and answer any questions you may have about orthodontic treatment. Call us today to schedule an appointment. We look forward to helping you improve your smile! Choosing whether to use Invisalign or traditional braces to improve your smile is perhaps the most important decision you will make on your orthodontic journey. The type of treatment you choose to use will not only determine the length of your treatment and how much it costs, but it will determine the results you see when treatment is completed. While an orthodontist is the only person who can tell you exactly what type of orthodontic treatment is best for you, it doesn’t hurt to learn more about both Invisalign and traditional braces. Learning more about these options can help you make a well-informed decision about which type of treatment is right for you. Traditional braces are what most people think of when they think of orthodontics. This is the mouth full of square brackets, rubber bands, and wires. Using a series of clear plastic aligner trays, Invisalign subtly shifts your teeth into proper alignment. Just like with traditional braces, there are benefits and drawbacks to Invisalign. Every person has different needs when it comes to the type of orthodontic treatment that is recommended. Even two people who have similar problems that need to be corrected to improve their smile could be given two different recommendations for treatment. An orthodontist will take all these factors into consideration and create a customized treatment plan that meets your needs. Before making a final decision regarding which type of orthodontic treatment to use, schedule a consultation with the orthodontists at OrthoCare Orthodontics. An orthodontic consultation is important because sometimes your preferred treatment might not be the most effective way to improve your smile. Your first orthodontic appointment allows you to explore treatment options with an orthodontist and find out which one is right for you. Are you ready to take the first step to improving your smile and oral health? Call OrthoCare Orthodontics today to schedule your complimentary orthodontic consultation at any of our four office locations located in North Carolina and South Carolina. When you have braces on teeth, those teeth need extra attention to protect them from decay, staining and gum disease. You should also take precautions to avoid damaging the braces. For example, activities to avoid include eating chewy or sticky sweets, eating hard or crunchy foods, biting your lip, breathing excessively through your mouth and pushing your tongue against your teeth, according to the Academy of General Dentistry. Although brushing twice a day is the standard oral care recommendation, when you wear braces, you should brush after every time you eat — even after that mid-afternoon vending machine snack or some late-night munchies. That's because food particles easily become trapped in the braces, and the longer those particles stay trapped, the greater risk you have of developing dental problems. Use a soft toothbrush with round bristles, or an electric toothbrush if you prefer. Start by rinsing your mouth with water to loosen food stuck in and around your braces. It's important to brush each tooth at the gum line and both above and below the brackets. Brush your gum line first, holding the toothbrush at a 45-degree angle. Next, clean the brackets by brushing at a downward angle on top of the brackets and brushing at an upward angle at the bottom of the brackets. Rinse again after brushing. Floss at least once a day, making sure you floss not only between the braces but also under the wires. To more easily floss under the wires, use a floss threader or orthodontic flosser, which you can buy at drug stores. Waxed floss is easier to slide between your teeth and less likely to snag on your braces than unwaxed floss. If you have space between your teeth, you might find that an interproximal (also called interdental) brush that goes between the teeth works better than flossing. Another option for hard-to-reach areas is an oral irrigator. Its stream of pulsating water can remove plaque and food debris. You can also rinse with mouthwash to kill any bacteria missed by brushing and flossing. When you wear braces, you need to be more aware of what you eat. Eating too many sugary and starchy foods can cause plaque to build up around the brackets, which can cause staining of the teeth, causing cavities or leading to gum disease. 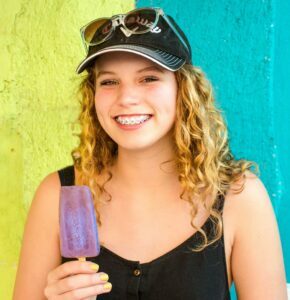 You should especially avoid sticky and chewy foods, such as dried fruits, caramel, taffy, corn on the cob and chewing gum, all of which can become stuck and be hard to remove from braces. Hard foods are another no-no. Foods such as nuts, ice, popcorn and beef jerky can break the wires of the braces and loosen the brackets. Even otherwise healthy foods, such as raw apples and carrots, can be problematic because their hard texture can damage the wires. To eat crunchy foods, cut them into small, bite-size pieces. If you are caught without a toothbrush, vigorously rinse your mouth with water (or mouthwash) and brush as soon as possible. Also, if your braces or wires chafe the inside of your lips, you can place a special wax on them to prevent this from happening. You can get this wax at drug stores, or just ask your dentist or orthodontist.